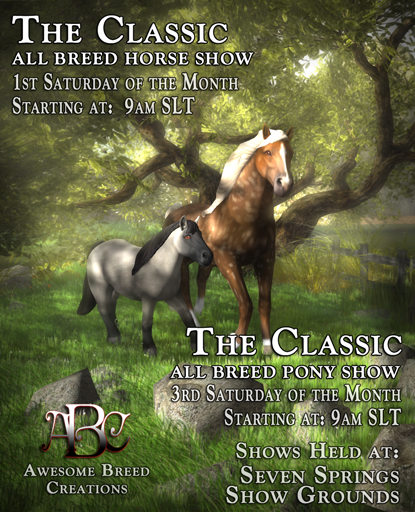 ABC – Awesome Breed Creations – Home of the Best Horses & Ponies in Second Life. 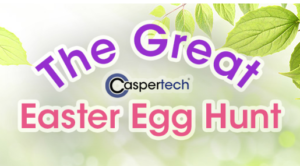 The Hunt is on… ABC has something for the hunters of The Great Easter Egg Hunt by Caspertech! Hippity Hoppity Easter is here! 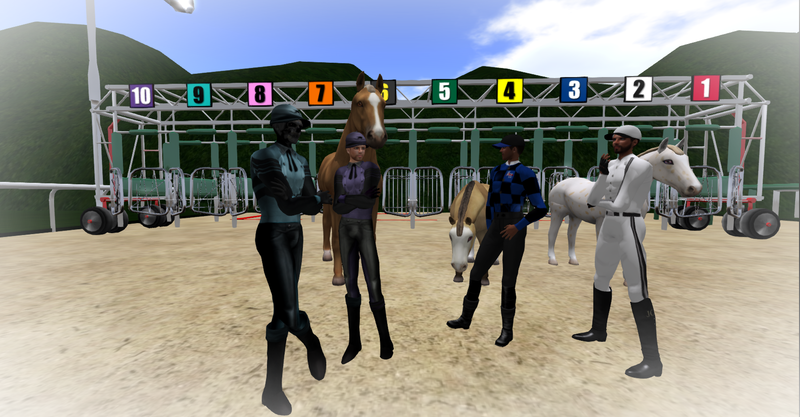 Join The ABC Race Authority for an ABC Jockey and Practical Class Thursday, April 18 @ 5 PM SLT. The practical portion of the class will be at 6:00 PM SLT. 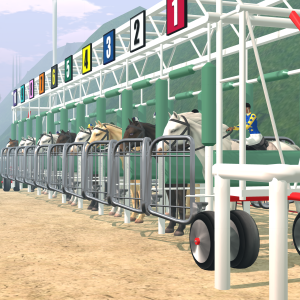 Hands On and Time Trial sessions were created to give potential jockeys, new jockeys, and veterans the opportunity to practice with someone from the Racing Authority (RA). The RA is available to set up the track, answer questions (there are something that are left to the jockey to figure out – part of your skills as a jockey), give you the opportunity to practice coming out of the gates, setting up equipment, and to practice with more jockeys on the track. Another great way to get more information is by analyzing the races (Thursday, Friday, Saturday, and Sunday)… Come watch and experience the amazing strategies that the jockeys implement depending on the situation. The Hands On and Time Trials are organized and ran by RA. They volunteer their time to give you a chance to practice and hone your skills. Please show them some Linden Lovins’ via tip jars that are out. Do you have some really cool photos of ABC horses and/or ponies? Add them to our group ABC Flickr pool for a chance to win store credit and have your photo displayed in the main shop! Once a month a photo will be chosen and the winner will receive L$1000 ABC store credit, their photo displayed in the main shop and photo will be linked back to your Flickr page (if it is public) on click to show off all your other photos as well! 1. Be sure your SL Legacy name is in the description if its different than your Flickr name. 2. Prize can only be won once per avatar, per quarter, including known alts. 3. 1k prize will be for ABC product only, cannot be exchanged for lindens. 4. By adding your photo to the pool you agree to allow it to be used by ABC – Awesome Breed Creations for promotional purposes. ABC CONGRATULATES THE WINNERS OF THE CLASSIC ALL-BREED HORSE SHOW HELD ON APRIL 6, 2019, FEATURING ABC – AWESOME BREED CREATIONS BREEDABLE. Bunny kisses, Easter wishes, new flowers, springtime, and sunshine. ABC is blooming with vibrant designer starters to brighten your day! What makes our Designer Starters different you ask? Well first off, they come in a gacha with 7 great colors to win. Then when 2 Designer Starters are bred together, you will receive a special foal with a special coat and eye, sometime during their breeding cycle. This will only happen once per starter, so if you buy a “gently used” Designer Starter from someone else looking for that special baby, you will need to check the history to see if it’s already had one or not. Also at the end of their life cycle the Designer horses will pet out instead of auto-CR like our “normal” starters do. • New Easter Designer Starters in a Gacha with 7 Stunning coats! 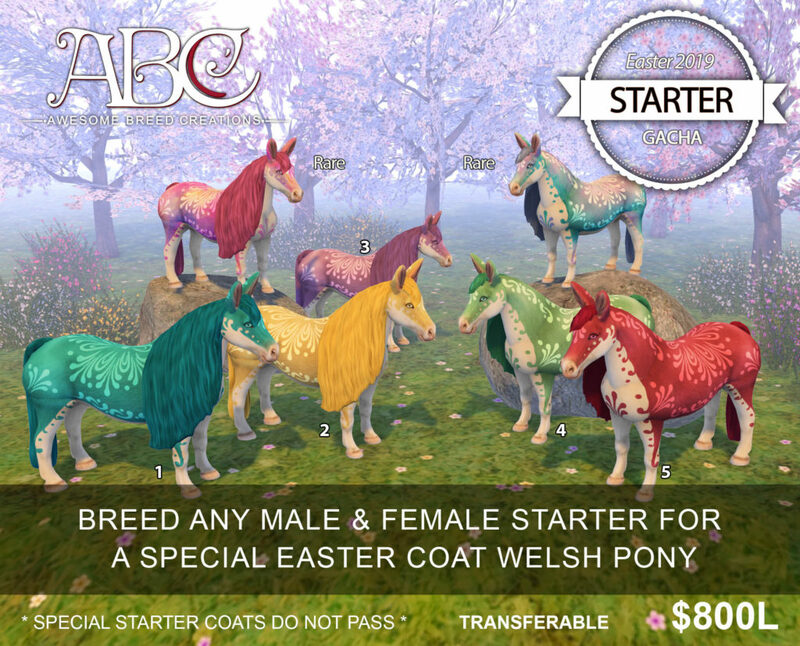 • Mate 2 Easter Designer Starters to get the Welsh Pony foal with a one time special Easter Coat & Eye! • Each Easter Designer Starter will ONLY produce 1 Easter Coat Welsh Pony foal. • All other breeding will pull from the gene pool like “normal” starters. • Easter Designer Starters will Pet-Out at age 141. • Coats on the Easter Designer Starters DO NOT pass. • Use caution when buying the Easter Designer Starters on the secondary market IF you are looking to make a Easter Welsh Pony Foal. Each one will be L$800 (there will be one vendor for male and one for female and they are transferable). Gacha Vendors Located at the ABC Main Shop. Easter is on its way!!! Congratulations for Kya Munster being chosen as the ABC – Awesome Breed Creations March 2019 Customer of the Month. Kya is well known in the community for having a big heart and sweetest dispositions. With out hesitation she is there to help with information, guidance, or just pointing people in the right direction. She adores her breedables and tries to make the experience amazing for her SL daughter. They share a camaraderie with trying new things and engaging the community with them on their ABC journey. Kya participates in the community and events across ABC and is always spreading the word of all things ABC. The best part is her willingness to learn and figure out how to apply the knowledge. ABC has a remarkable community member and it is great having Kya in the ABC Community. Congratulations Kya… you are an inspiration among the ABC Community. 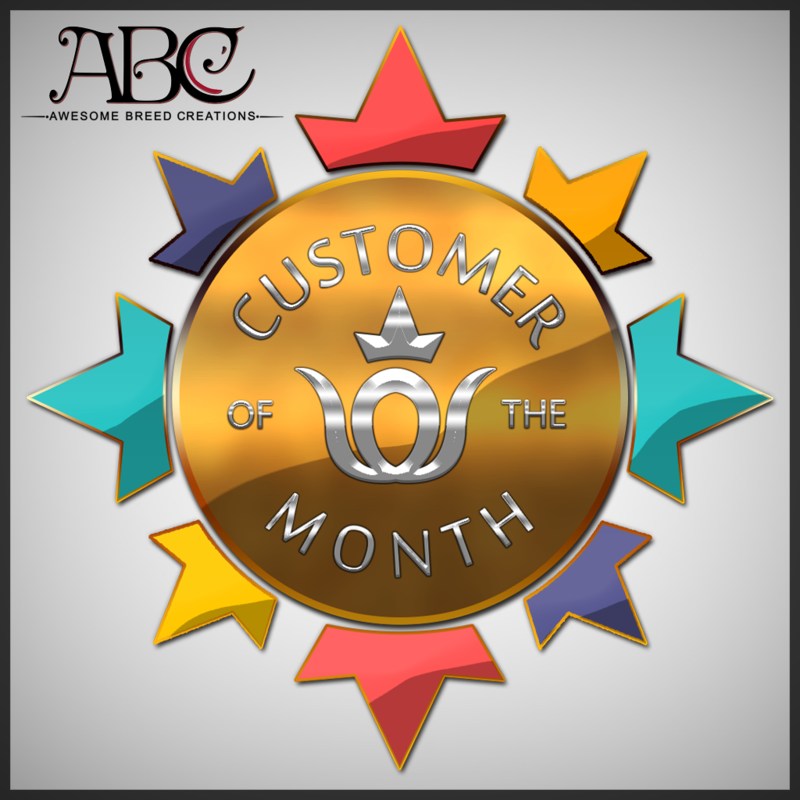 Once per month one of our most outstanding ABC – Awesome Breed Creations Customers will be selected as the Customer of the Month. With this title you will have your picture placed in the ABC Main Shop. 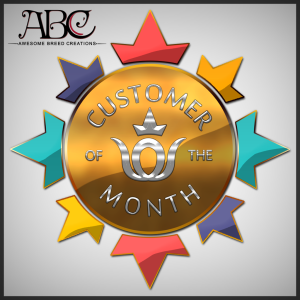 You will be awarded a special ABC Quest Badge in honor of being such a wonderful customer. You will also get to pick out 1 select prize pack! Examples of what we will be looking for in the selection of our ABC Customer of the Month. Be kind to others, be helpful, polite, courteous and never be afraid to make someone smile! 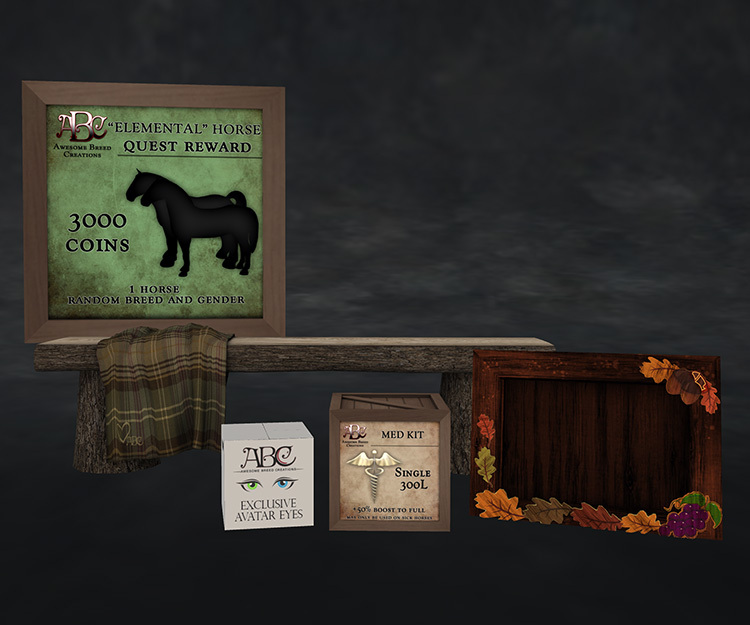 You must also BE a member of the ABC Main Group & have a pick in your Second Life profile featuring ABC – Awesome Breed Creations. We look forward to celebrating you all, and can’t wait to select our very first ABC Customer of the Month! Lets Take A Closer Look At Past Barn Box Items! It is time to sign up for the ABC – Monthly Barn Box Subscription. Sign ups are open (via the ABC – Monthly Barn Box Group) and you don’t want to miss out! 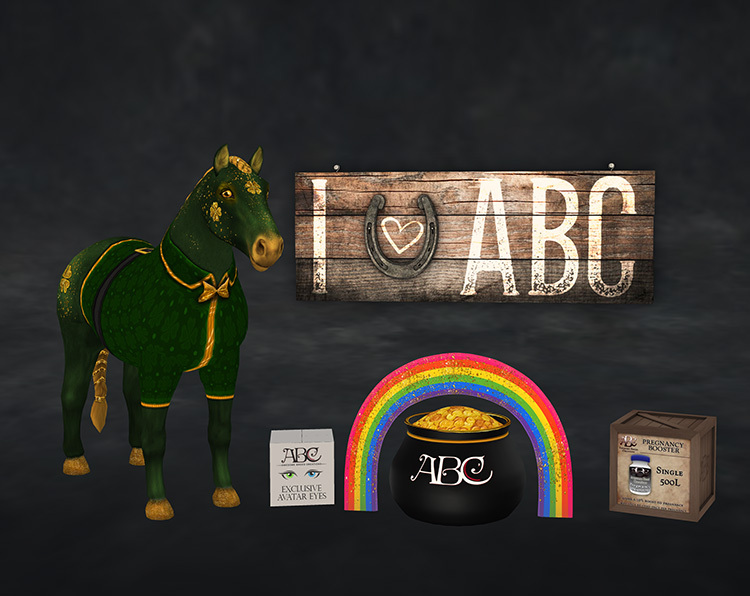 If you are new to the ABC – Monthly Barn Box Subscriptions, take a look at some of our past boxes and see what was inside! The upcoming ABC – Monthly Barn Box is going to be filled with more awesome Spring & Easter goodies! • Each box will feature carefully chosen ABC items as well as exclusive items. • Delivery is set up to check that your avatar is in-world before the box is sent. • Rejected packages will NOT be replaced. • IMPORTANT: Once the box is sent in-world, all subscribers will be EJECTED from the ABC – Monthly Barn Box group in order for you to re-subscribe/pay for the next months box. It is time for your horse and pony to celebrate St Patrick’s Day! Available at the ABC Main Shop! 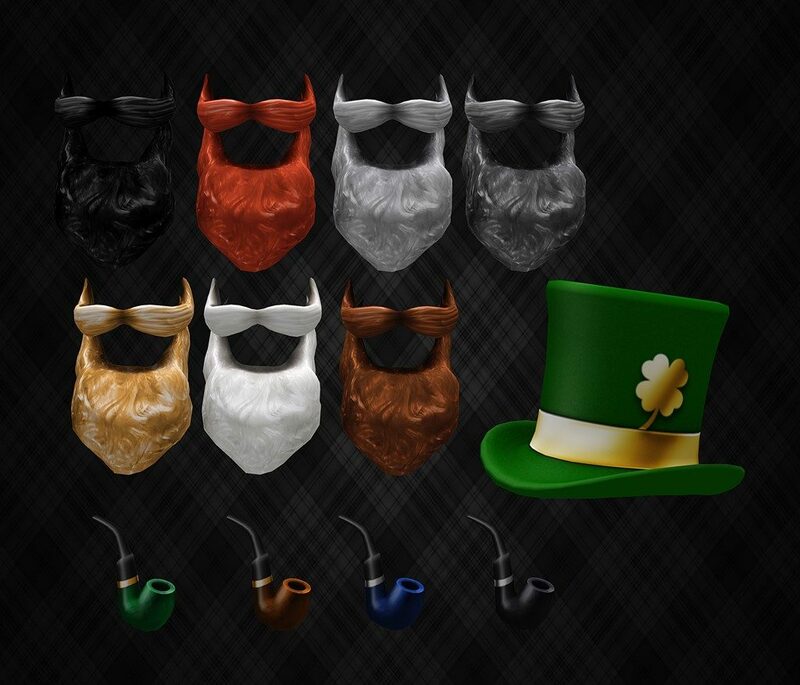 These will go great with the recently released ABC St. Patrick’s Day Designer Shell Packs! The ABC St. Patrick’s Day Designer Shell Pack will bring you luck and ward off some of the bad. Spread the luck of the Irish around your stables with these shells for your horses and ponies! 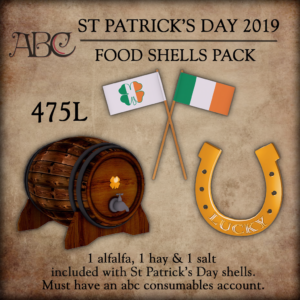 ABC 2019 St Patrick’s Day Designer Shell Packs (with consumables). You must have food in your ABC Consumables account for these items to work. The 3 piece set is L$475 and includes 1 Hay, 1 Alfalfa and 1 Salt with the designer shells. Available at the ABC Main Shop.